Batman v Superman: Dawn of Justice is a 2016 American superhero film featuring the DC Comics characters Batman and Superman. It is a follow-up to 2013's Man of Steel. The film is directed by Zack Snyder and stars Ben Affleck, Henry Cavill, Amy Adams, Jesse Eisenberg, Diane Lane, Laurence Fishburne, Jeremy Irons, Holly Hunter and Gal Gadot. Batman v Superman: Dawn of Justice is the first live-action film to feature both Batman and Superman, as well as the first theatrical film to feature live-action portrayals of Wonder Woman, Aquaman, Cyborg and the Flash. The film had the biggest opening for a superhero film at more than $420 million. It is available in 2D, 3D, IMAX 3D, 4DX, premium large formats and 70 mm prints. The story goes like this: Following his titanic struggle against General Zod, Metropolis has been razed to the ground and Superman is the most controversial figure in the world. While for many he is still an emblem of hope, a growing number of people consider him a threat to humanity, seeking justice for the chaos he has brought to Earth. As far as Bruce Wayne is concerned, Superman is clearly a danger to society. He fears for the future of the world with such a reckless power left ungoverned, and so he dons his mask and cape to right Superman's wrongs. The rivalry between them is furious, fueled by bitterness and vengeance, and nothing can dissuade them from waging this war. However, a dark new threat arises in the form of a third man: one who has a power greater than either of them to endanger the world and cause total destruction! 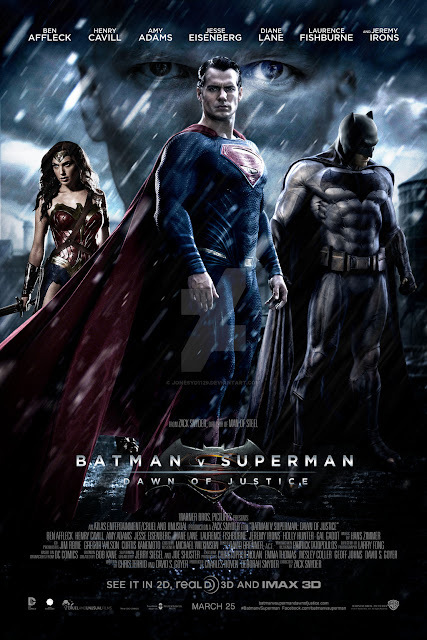 Batman v Superman: Dawn of Justice is of action, adventure, sci-fi, and fantasy genre, which runs for approximately 151 minutes. It's Rated PG-13 in most countries for intense sequences of violence and action throughout, and some sensuality. Well, it's an action-packed film loaded with mind-blowing special effects. I must say that it's very lengthy with some parts being quite dragging. I can't help but feel that the storyline was not really that cohesive. It's as if they have been trying to put Superman and Batman in the same setting throughout the film, even if we know that they shouldn't. Casting and acting were good though. Wonder Woman was a revelation although I'm not quite convinced by her acting. Overall, it was an okay film. It's not bad at all unlike what critics are saying.